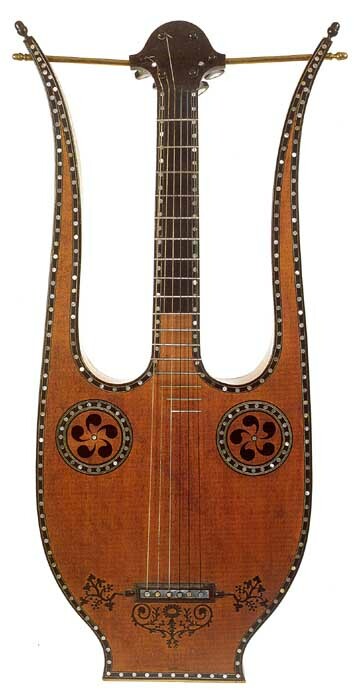 Note to the casual reader or researcher: This Reference Gallery features historical instruments that are not harp guitars, but “relatives” or distant “cousins” – presented on Harpguitars.net for historical and organological comparison. March, 2015: I guess my efforts paid off! December, 2014 saw the publication of The Grove Dictionary of Musical Instruments (Second Edition), for which I was asked to edit the "Lyre Guitar" entry. I left some of the introductory text by Bonner & Ophee alone, but completely re-wrote the organology portions, based on the following work below. Before the reader begins browsing through this page, I strongly suggest taking the time to read the following introductory material. May, 2007: I re-arranged and added organology from Stephen Bonner's excellent 1972 work, The Classic Image: European History and Manufacture of the Lyre Guitar, 850-1840 (copy generously supplied by John Doan). Look for these notes in red. According to Matanya Ophee, the bulk of Bonner's work was copied from an earlier 1927 Swedish work by Daniel Fryklund. Subsequently, Ophee and other researchers seem to subscribe to these same organological views as well. Unfortunately, as is often the case, I have a very different view on how to classify and organize these instruments; they share some of the same problems as harp guitar classification and many new ones of their own. Bonner has clearly done much more thorough research than I; on the other hand, additional instruments have come to light, and while his excellent historical facts and provenance cannot be argued with, organology is still largely a matter of interpretation. I should note that other researchers follow most of Bonner's conclusions as well; I may be the sole dissident (but then, that is my blessing and curse!). My comments in red will address conclusions in Bonner's and/or Ophee's works. 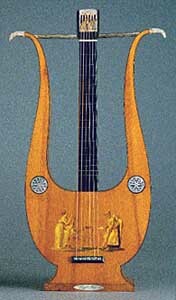 While I of course applaud Bonner's seminal work which presents the "lyre guitar" in a rich historical, musicological and sociological reference, I would have preferred to see such a work (and future such articles) refer to "Lyre Guitars and Other Fretted Instruments in Lyre Form" or similar. I prefer to limit the "lyre guitar" name to the French instruments below that stand on a base (some of which have short or no arms! ), certain of the Italian examples (some without a base) and the odd German, Spanish or other example. 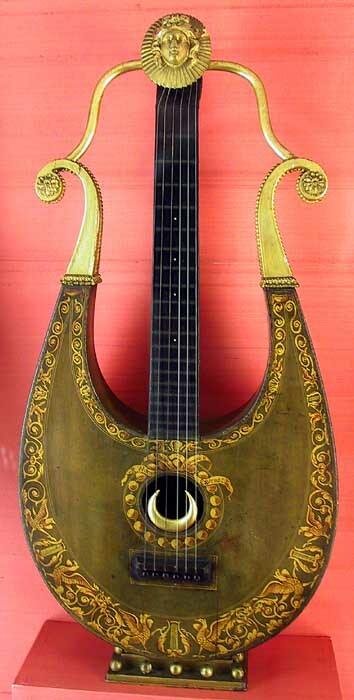 There are many other types of guitars in lyre form as well (not discussed in Bonner's work as they are from a separate history) and other vaguely "guitar-looking" lyre instruments that are included in Bonner's and other researcher's lyre guitar lumped category. All of these instruments are featured somewhere on this site, as this is an organological, rather than historical, presentation. For researchers studying lyre-shaped plucked fretted instruments of any type, here is a list of all possible such instruments either in name or shape that could possibly be construed, misconstrued, or discussed under the topic of "Lyre Guitars." Each entry links to the appropriate (and often vastly different) Gallery page on this site. Note that this is just a simple snapshot, as this is a brief side topic included in Harpguitars.net. Harpolyre (the name causes it to be sometimes discussed in the context of lyre guitars. 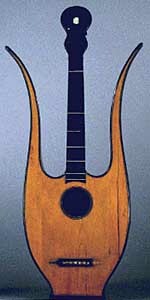 Some consider the outer two necks as representing the lyre guitar shape. 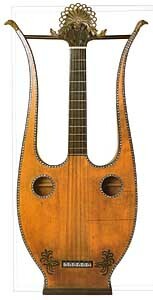 Since all lyre guitars have hollow arms, posts, etc and not necks, I don't see the resemblance. 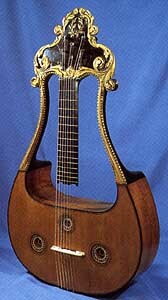 To me, this unique instrument is "triple guitar neck" in form, not "lyre shaped." These instruments have a rounded bottom, a suspended, "floating" fingerboard, and a larger number of strings (7-9). They are often referred to as "French lyres" - though obvious confusion exists with the equally-French lyre guitars. All agree that they appeared before the lyre guitars, and perhaps instigated the lyre guitar's inevitable creation. However, they definitely need some sort of distinct typology name to differentiate them from the typical "lyre guitars" below (the majority of which are also French). An additional problem for the discussion of this broad group of instruments it that tutors, ads and vernacular use often referred to the markedly different instruments simply as "lyre" (in English, pronounced "LIE-r," rather than "LEER-a"). I reach the first of my disagreements with Bonner (and many other scholars) right off the bat. He categorizes the row of instruments below, along with many others (including some lyre-shaped members of the harp-lute family which I place here), as "lyre guitars." In other words, in the same family as those which I refer to as "true" lyre guitars below. 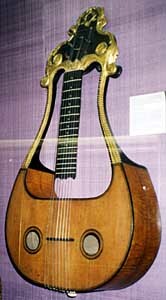 In fact, he includes nearly all early fretted, lyre-shaped instruments in his family of "lyre guitars." My interpretation on this is that just because a stringed instrument has a lyre shape and a fretboard of some kind does not automatically denote it specifically as a form of guitar. I believe we should limit discussions of "Lyre Guitars" to guitars. In both Bonner's and Ophee's cases, their otherwise decent articles would have been better titled "Lyre Guitars and Other Fretted Instruments in Lyre Form". The "French Lyre" instruments below always had 7 to 9 strings - and, as far as I have been able to determine - no one knows how they were tuned. They could just as easily (and wrongly) be classified as "lyre lutes" or "lyre citterns." Similarly, the apollo lyre - another in Bonner's (and Ophee's) list of lyre guitar types - should not in my opinion be lumped in with lyre guitars, but with harp-lutes, as I have done on this site. For this one, the tuning is known, and we know that, despite having six strings (with Light's versions having 11 or 12), it is not tuned like a guitar, but as the other members of the harp-lute family (and it was constructed in the manner of the harp-lutes, not a guitar). 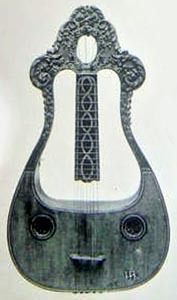 The harp-lutes were a distinct new instrument with their own form and construction that copied their tuning not from the guitar, but from the English Guitar, a cittern-like instrument. Thus the harp-lutes had their own tuning and tradition of musical literature - as opposed to the lineage of the guitar and it's tuning and literature, which the lyre guitar grafted itself into, being newly conceived in the 1780's having no literature of it's own (this excellent comment provided by John Doan). I am adding these arguments because we are in dangerous territory here. If we were to truly regard the Apollo Lyre as a lyre guitar (as Bonner and others claim), then by the exact same reasoning and (il)logic, a Light harp-lute-guitar, or even a harp-lute would have to be similarly construed as a harp guitar (as I define the harp guitar today). Readers should by now know what I think of that premise. As with harp guitars, I tend to differentiate those with genuine guitar aspects, including tuning and playing, from the other creative hybrid inventions. 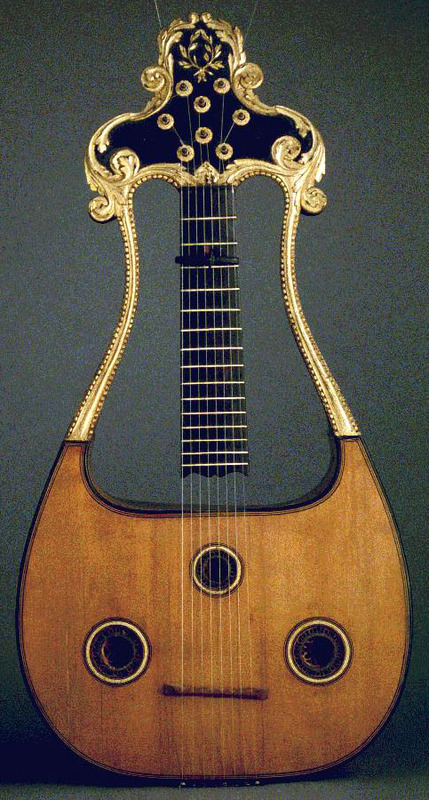 I would expect that scholars who see great importance in the musical differences between these instruments as a key component to their separate classification would conclude this as well, but this does not seem to be the case - even though the "lyres" of the C (or Eb)-tuned Harp-Lute family and the "lyres" of the guitar-tuned French lyre guitar family had their own specific tunings, tutors and music. Back to the French Lyre. 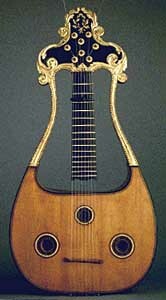 Bonner has named these the "'one-piece' rounded" type of lyre guitar. The lone example far right he names "'one-piece' classic" type. That specimen in particular illustrates my problems with Bonner's conclusions. It always seems dangerous to me to base a serious, final organological premise on a single surviving instrument - a "one-off" as it were. Although it is commendable to want to come up with words or even a "type term" to classify a lone invention. 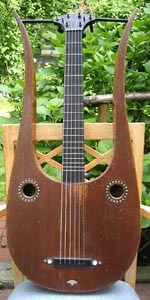 Additionally, this 7-string "oddball" instrument is described by Baines (1966) as having steel strings - which, if original would suggest a cittern lineage more than a guitar lineage. 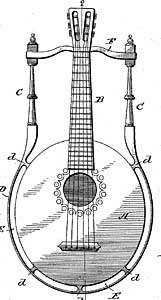 And as indicated by the fact that every specimen has the strings going over a bridge to attach to the edge of the body, I hypothesize that steel strings were original on all these "lyre-cittern hybrids" (guitars of this period had gut strings tied to a glued on top bridge, steel strings were almost always attached at the end of the body, thus denoting a cittern or other steel string instrument). Still, all previous researchers and museum curators seem to miss this fact and continue to label them "lyre guitar." 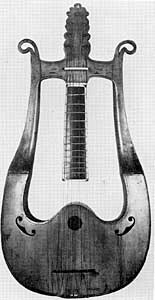 I'm not exactly sure why Bonner called these "one-piece" instruments as opposed to any of the others, and again, I separate them from the lyre guitars next discussed. It is possible that they were tuned like a guitar - either 5 or 6 courses - with the additional strings used as descending notes - but string length (and aforementioned steel stringing) would deem this highly unlikely, if not absurd! 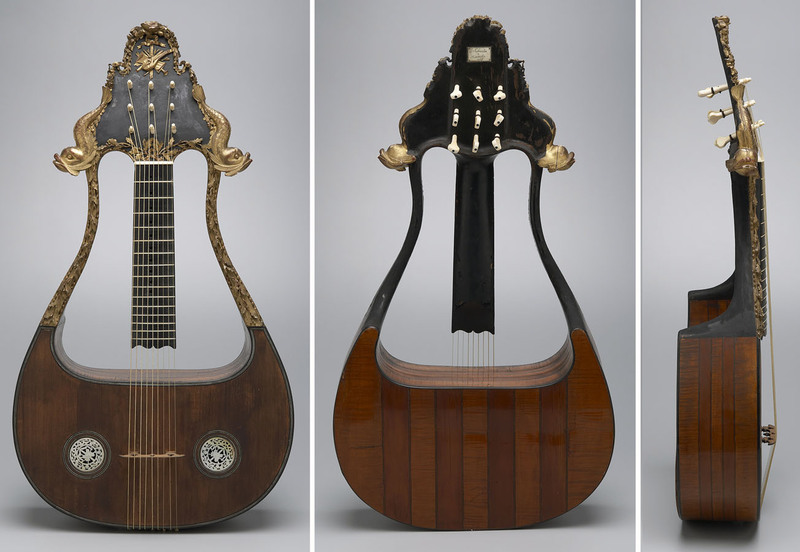 UPDATE November, 2011: The instrument in the Yale collection (first image below), which I examined in 2011, has a scale length of only 49cm (19-5/16") - much closer to English Guitars and other cittern-like instruments, but a far cry from a guitar. And how could "descending" basses" possibly be included on such a small instrument?!. With the holes for a capotasto at nearly every fret position, I find it more likely that they were tuned like an English Guitar to open C (CEGCEG with 3 descending notes, or CEG with 6 descending notes), or something altogether unique (it could have been diatonic, but I doubt it). Nowhere have I seen evidence as to this tuning (and wouldn't this be a key feature of classification?!). Note: In the Grove's Dictionary entry, Ophee states that these instruments appeared with or without fingerboards and were tuned diatonically. The source of this information appears to be Fryklund, who, in Ophee's GFA Soundboard article (1987/88), is quoted as only being "led to suspect" that similar instruments without a floating fingerboard may have existed, and then speculates a diatonic tuning for this theoretical instrument. Fryklund (and Bonner) in turn, may have gotten this information from the anonymous German writer, who in "Einige Worte Uber die neue franzosische Lyre" says "As you know, the old Lyra had fifteen strings, but no fingerboard" (translation by Michael Lloyd for Bonner). To my knowledge, no such instrument (or tuning) has been proven to exist. The German writer does not allude to the tuning of this "old lyra" nor mention the 7-9 string French Lyre. 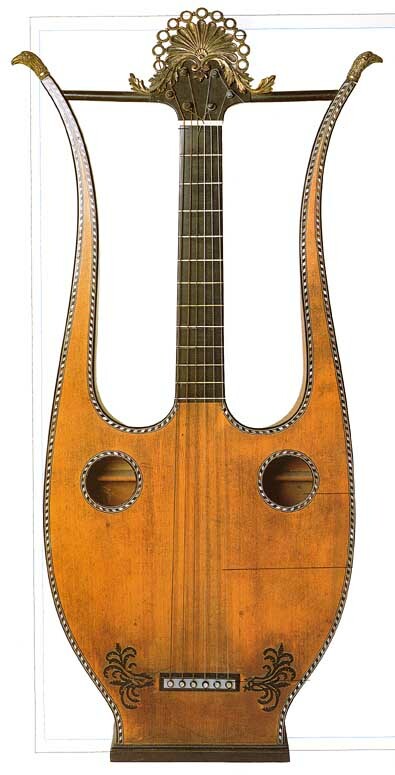 If Fryklund and others were correct about such an evolutionary instrument, it would seem to me to further bolster a separation of these strange instruments from true lyre guitars (especially if we assume it evolved from a 15-string diatonic "harp-tuned" instrument!). In any event, with just the evidence at hand, I consider this a unique and distinct historical instrument. Seriously, I don't understand how Fryklund, Bonner and Ophee could all theorize a diatonic tuning and still consider it a guitar form. In my view, the floating-in-space fingerboard is perhaps the most unique feature here. Second in uniqueness would be the body - unlike any other instrument - and of course the tuning (whatever it was). I would think that it warrants a unique name based on these features. "French lyre" (as opposed to "French lyre guitar" has been used by some scholars, and that is what I currently prefer to use as well. However, Bonner mentions that the English refer to the typical lyre guitar (seen next) as the "French lyre" (without the "guitar"), so there will likely be plenty of confusion no matter what! Well-known decorative "parlor" instruments of the 1800s. The majority of examples are French, with some notable Italian specimens, and include endless styles. 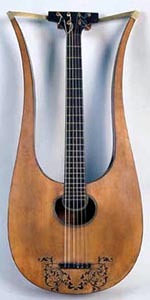 Except for a few well-known Italian examples, virtually all members of this family stand upright on a flat base which is incorporated directly into the shape of the guitar's body. These, I consider the "true," or typical, lyre guitar - though there is probably no way at this point in history to reserve the name specifically for these instruments. 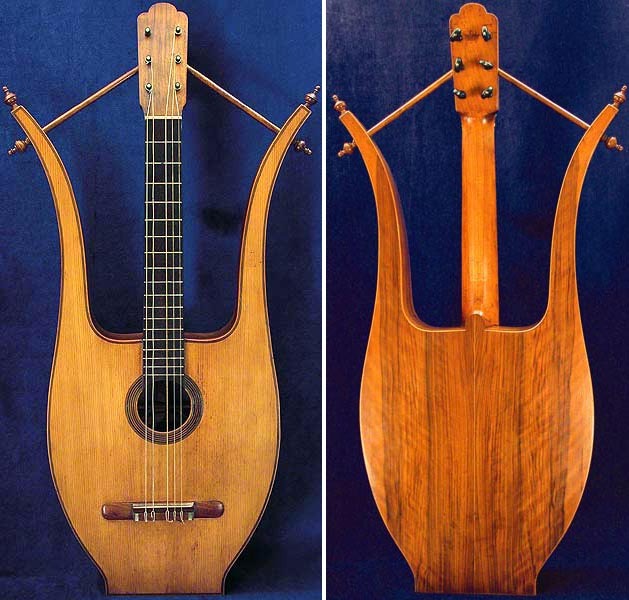 There are many other types of instruments known - rightly or wrongly - as "lyre guitars": the Apollo Lyres, in the harp-lute family, which appear superficially similar to these below, the "French lyres" above, and standard guitars in "lyre" form, such as the Washburn (under Hollow-arm guitars, type B). 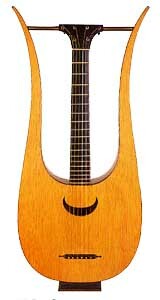 There are also harp guitars which have appropriated the name, such as Mozzani's chitarra-lyras, which are harp guitars (under Form 3a and 3c) with either a single or a continuous arm (but, ironically never just two separated arms!). Of Bonner's eight "lyre guitar" typology forms, I thus disallow half of them, with two others being gray areas in my mind. I will attempt to separate the specimens here to match Bonner's remaining types, and note those for which he seems not to have a category (please feel free to correct me, if any seem wrong). My above paragraph still stands. Most are French - which I consider the "archetype" - the others are Italian, with a couple of rare Spanish versions. The English types Bonner discusses are those I place in the the harp-lute family and not with guitars at all. The Italian examples, very few in number, I find to be more ambiguous. The first and largest selection of lyre guitars have hollow arms. Of course, historical lyres all have a yoke or cross-bar to which the strings are attached and tuned. Some lyre guitar makers emulate this, many do not. Note the typical fanciful headstock/tuner arrangement of this first group. Bonner gives the name "french classic" for this type: a true 6-string guitar tuning, and always standing on a pedestal. He specifies that a yoke is usually present. He provides a very specific, but short, list of museum specimens to fill these categories, but misses other shapes and sizes that fall "between the cracks." Therefore, I am not sure which of these specimens would be considered "french classic" and which would not. I would consider this an extreme form of the 'french classic' shape. An unusual model with no yoke and a more typical guitar headstock. Bonner does not specifically address this option. OK, now I'm really going to confuse things! The following instrument - in the Tiroler Landesmuseum Ferdinandeum in Innsbruck - recently became known to me (from Dr. Stefan Hackl, through my Belgium correspondent Benoit Melle-Stef). It has the basic French form and atypical guitar headstock as in the previous example, but has 3 floating bass strings! 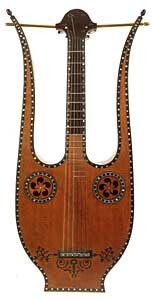 Thus, this is the first known, authentic historical "harp-lyre guitar. 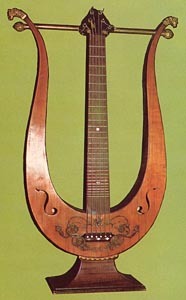 In other words, a "true harp guitar" version of a "true lyre guitar." I have long wondered if any such historical instrument might ever turn up. No one, including Bonner, has ever addressed such an instrument (likely, no one was ever aware of it). Hollow arms occasionally give way to solid, as in this first gorgeous example. 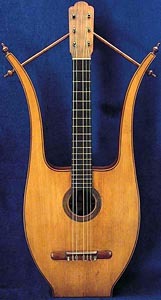 I would call this a unique "pillar form" of French lyre guitar. Bonner considers the Pons version a "more 'revivalist' type of the Boulan instrument" (which I placed at the top in the "French Lyre" category). I have no idea why he did so. 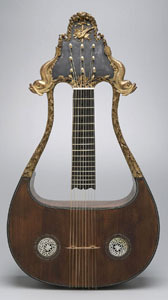 This instrument borrows its headstock design from the "French lyres" at top of this page. Bonner does not specifically address this shape. Other than the soundhole, this specimen appears almost more French than Italian. German and Austrian instruments were made as well; Fryklund (1927) mentions German ladies performing on them. I've yet to see all these specimens. 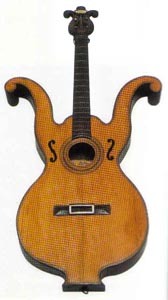 This German instrument mimics the shape and yoke of the original Fabricatore form above, and the soundholes of a typical French model. Still with hollow arms, this next group is using more traditional guitar headstocks and tuners. This appears to be a Spanish variation of the typical French form. Spanish instruments are not illustrated in Bonner's work, and one researcher considers these much later instruments "less important" instruments. Rare lyre forms from Portugal - these appear to be based on Portuguese violas and Portuguese guitars, rather than Spanish-style guitars. 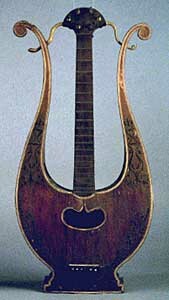 The makers of some of these instruments below called their instruments "lyre guitars" - others may have been classified as such by researchers. Either way, they hold the record for "most ridiculously short arms." Though an oxymoron (as I am continually pointing out about the nomenclature of Mozzani's single-arm harp guitars), I would have to agree that these definitely fall under the heading and subject of the classic French-type lyre guitars. Note that they all stand upright on a base - an important criteria of most "true" lyre guitars. Bonner lists none of these instruments under his lyre guitar typology. Believe it or not, this would be classified as a lyre guitar also - even though completely armless! 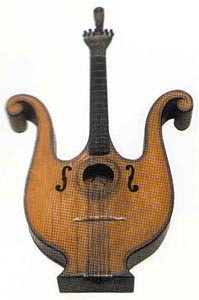 Lacôte made a virtually identical instrument. A somewhat sketchy use of the name. See additional lyre-shaped instruments in the Harp-Lute family, Hollow-arm Guitar family, Form 3b and 3c of the Harp Guitar family.